One of the main reasons our partners choose to set up a CiviCRM application is its extended functionality developed specifically for managing all contacts, communications, records and activities of an organization in one place. Yet one of our clients put a broader meaning into the concept single CiviCRM-based solution and requested new functionality that would allow users to manage their emails (check and read incoming emails, compose new messages, etc.) from the CRM instead of shifting between different applications. 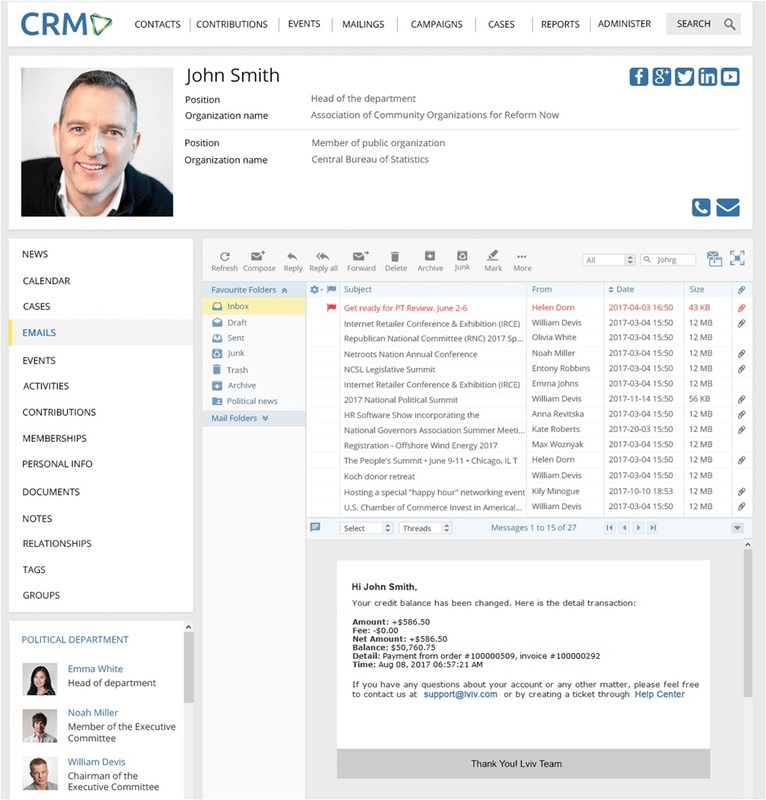 In other words, the client requested an inbuilt email client for CiviCRM that would prevent the staff from wasting time by tediously switching between CRM and Emails. Instead of working with several browser tabs open at once, now the client will use a new menu item named “Emails” to opens the email client in the main working area. The email client provides all major functionality for work with emails not leaving CiviCRM. To implement the functionality, Agiliway analysed a number of PHP-based email clients and finally went for RoundCube. The choice was conditioned by its rich functionality, great user interface, good performance and reliability, cost (it is an open-source tool), wide support and multiple integration tools available due to its popularity. For convenience, better user experience and simplified authentication we implemented a Single Sign-On solution so the users could have access to their emails automatically when logged into CiviCRM. Gone are the long KPass lists, paper scraps with complex passwords, tiresome login time and cases of a failed login - users no longer have to enter a password to access their email account. Additionally, the moment new accounts are added to the CiviCRM system, a new email box is created automatically for each new user. This relieves CRM administrators of a tedious routine task as well as security concerns. The functionality adds up to security as the need to send email passwords to new users instantly concludes. The user can manage their emails directly in CiviCRM by selecting Email menu item - it saves time and, most importantly, does not divert user’s attention away from CRM. The user does not need to remember and enter separate passwords to log into CRM and the email client – it’s done automatically through Single Sign-On. Administration efforts are reduced - before system administrators had to setup an email client for each user separately, now the functionality is embedded in the CiviCRM system, the process is automatized and executed automatically. All in all, it is a big time save for a country-wide public organization with thousand users. Email Client Integration is just one of those CiviCRM integration projects Agiliway did to implement the CiviCRM-based management solution for a geographically distributed political organization. Besides Email Client integration, there are other projects, such as ERP integration, Workplace by Facebook Integration, building Document Management, KPI and Budget Planning modules, which are taken up to provide an integrated environment for effective work of political party officers and will be elaborated on in our next articles.